December is finally here! I think it’s safe to say most people are starting to celebrate the holidays now. 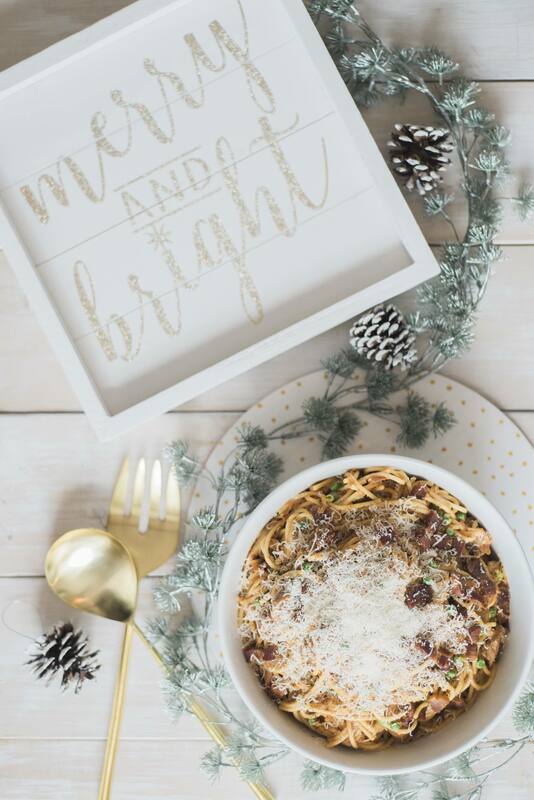 We love to host and entertain our loved ones this time of year so today I thought I’d share our favourite recipe to make for our guests. 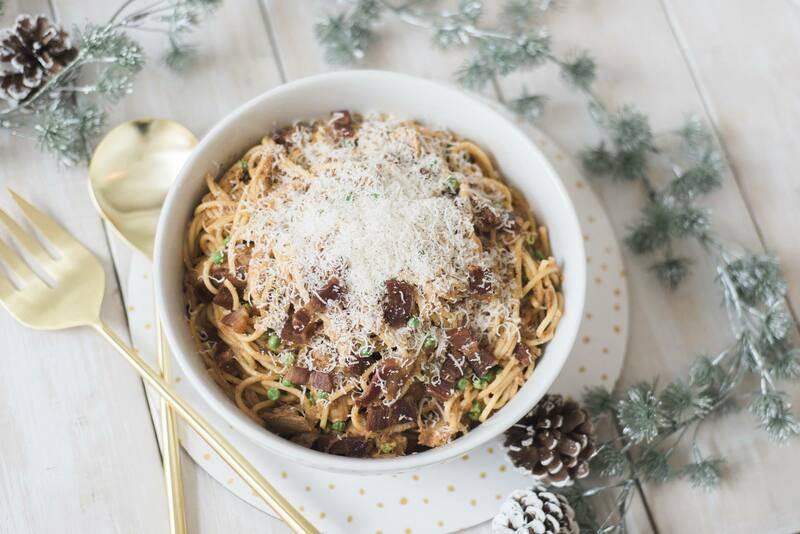 We like to use cured meats in our holiday recipes as it’s so nostalgic this time of year. They really elevate the taste of your dish and make for an elegant presentation when you’re entertaining. 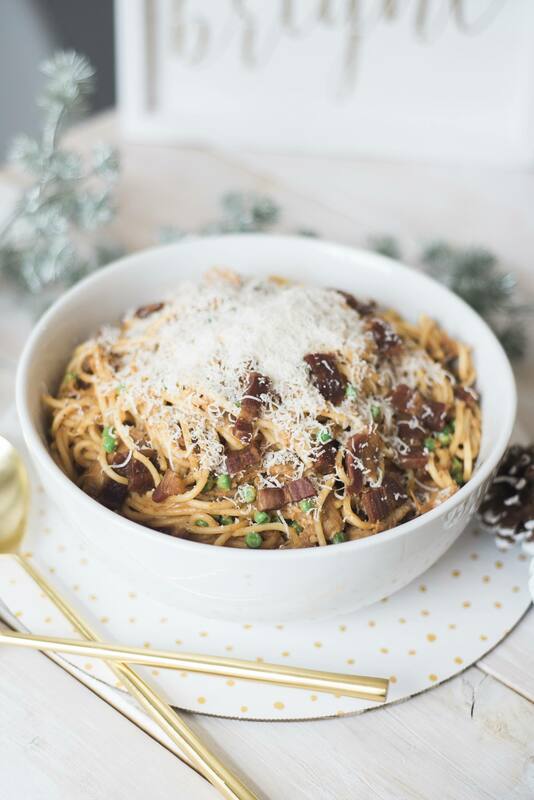 Today we’re using this delicious Mastro Pancetta for our pasta, it is so tasty and completely transforms the recipe with its unique flavour. 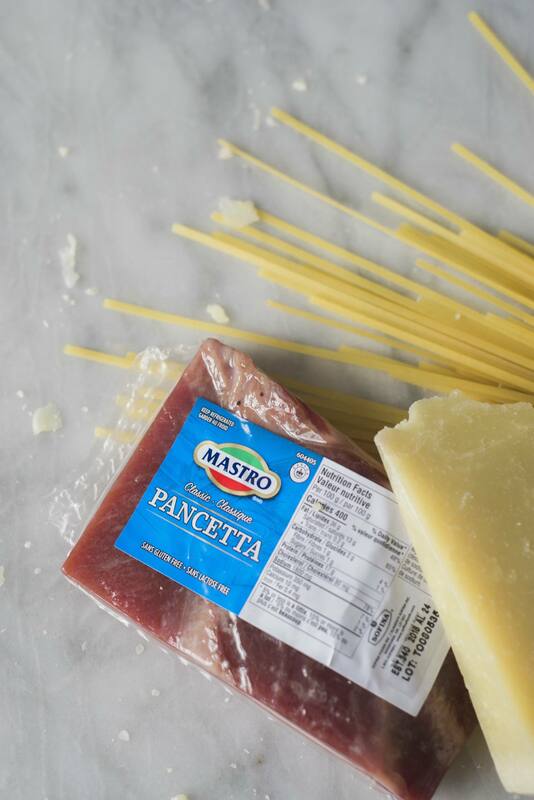 Mastro is our brand of choice when we’re shopping for Pancetta. They always honour the taste and tradition of savoury Italian deli by combining the finest ingredients and traditional slow aging. 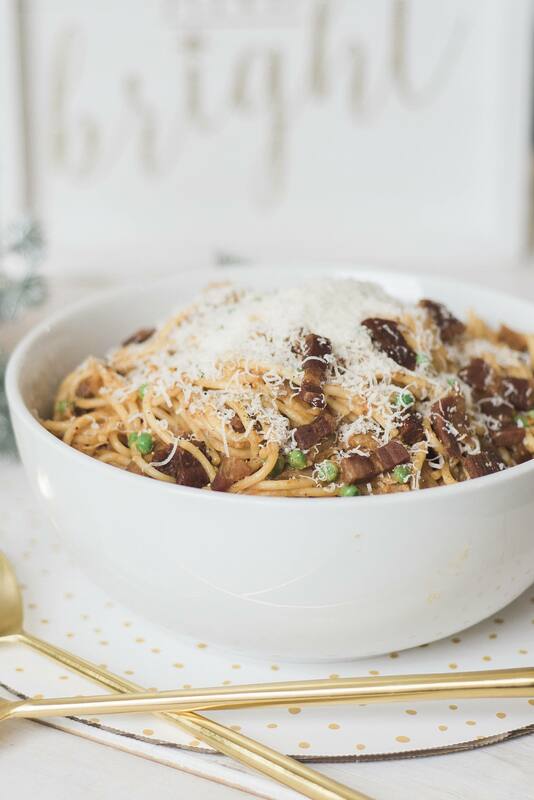 Their Pancetta is always so flavourful and makes this dish really stand out. It’s definitely a crowd pleaser! 1. In a medium sauce pan at medium to high heat add olive oil and chopped shallot with salt and pepper. Cook until soft and translucent. 2. Add garlic with a garlic press cook until fragrant (1min) careful not to cook the garlic too long as it will become bitter. 3. Add paprika, thyme and basil and stir until even. 4. Add chicken seasoned with salt and pepper and turn on all sides until chicken is cooked. Then add strained tomatoes coating the chicken. Turn the heat down to simmer. 5. Whisk in three yolks and grated cheese then set aside. 6. In a deep large bottomed frying pan (stainless steel preferred) add Mastro pancetta and brown on medium to low heat. 7. 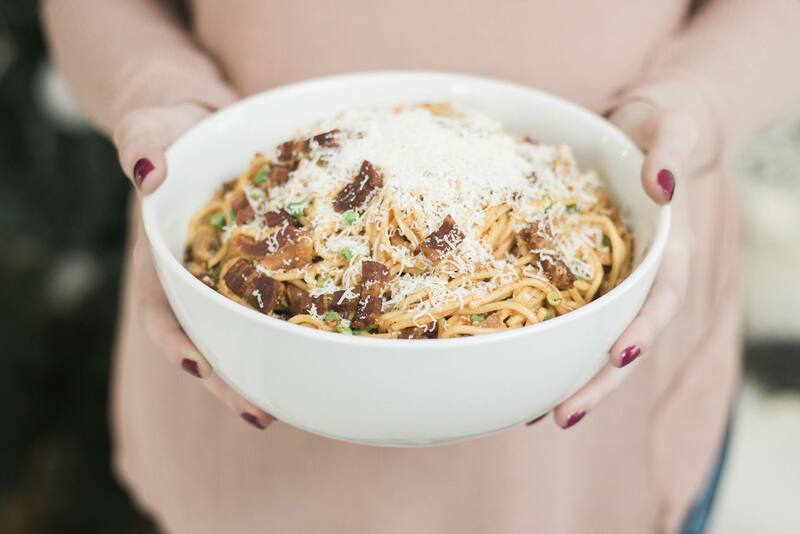 Once browned take out pancetta and place in a bowl and set aside. Drain 1/2 of the fat from the frying pan turn heat down to low and add the cooked spaghettoni and a some of the pasta water (aprox 5 Tbl spoons) scraping up the brown bits to coat the spaghettoni. 8. Very slowly add yolks and cheese stirring the spaghettoni so that the yolk and cheese mixture does not solidify. Once spaghettoni is coated completely slowly add the chicken in the tomato sauce and twist and stir until mixed in and the the sauce is creamy rosé. 9. Add the peas and garnish with graded Grana padano and serve. Voila! 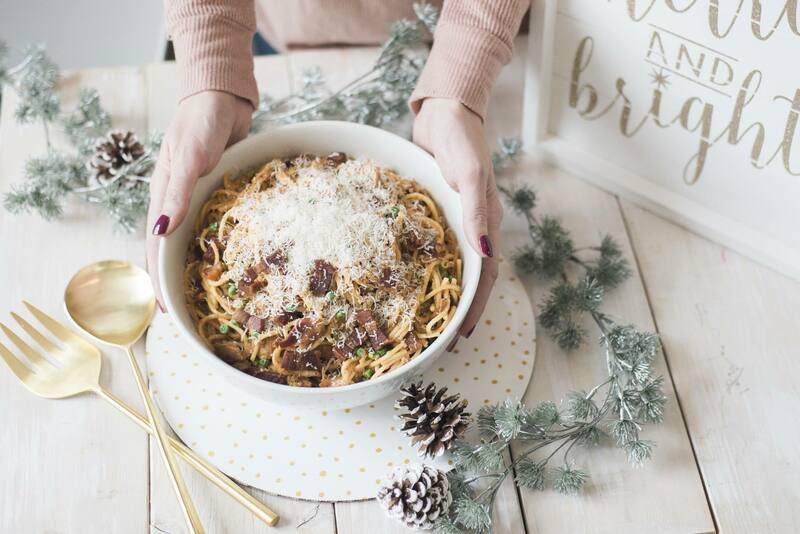 Let me know if you try this delicious dish out over the holidays and what you think! This post was sponsored by Mastro San Daniele however all thoughts and opinions are my own. Well pancetta is right up there but genoa salami beats it by just a little bit. 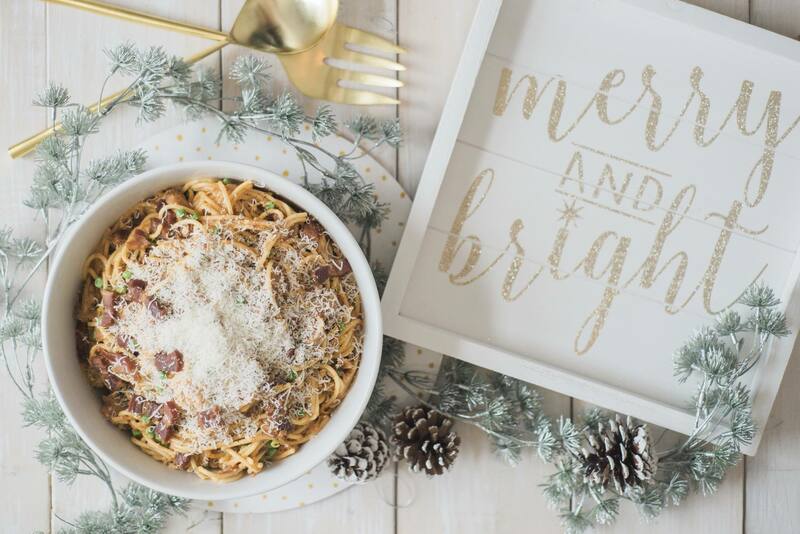 Your recipe looks ah-mazing, Renee! Chorizo is a family favorite. Cured ham is my favorite. I love salami. Goes well with everything!!! Hungarian salami is a current favourite cured meat. I love salami the best. My favorite is hard salami. My favorite cured meat is summer sausage. chorizo ! I love spicy ! Chorizo is my favorite hands down! Pepperoni, procueto and salami are on my list right now. Love the looks of your picture..looks very yummy. Ohhh pancetta, pancetta my mouth savorys at the though of you! 🙂 happy thoughts! Soppressata is probably my favorite cured meat. My favourite cured meat is proscuitto. I like finding Canadian made proscuitto.